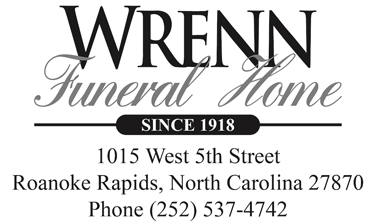 RRSpin - Lander Franklin Barker Jr.
Lander Franklin Barker, Jr., age 90, of Roanoke Rapids, NC died Monday April 8, 2019, at Halifax Regional Medical Center. Mr. Barker, was born in Bessemer City, NC the son of Lander F. Barker, Sr. and Jeanette Bridges Barker. He was also preceded in death by his wife Margaret Kincaid Barker, in 2014. He served in the U. S. Navy and was employed with the Indian River County Clerk’s Office, in Florida. Surviving are: two sons, Lander F. Barker, III and his wife Heidi, of Roanoke Rapids, NC and Brent Barker of Gaston, NC; two grandchildren, Janina and Carissa Pinnicchia , both of Roanoke Rapids, NC.